Trimming and pruning trees can be a tough job. You want a tool that can help you get the job done quickly and efficiently. That’s where a pole chainsaw comes in. The question is: which one should you buy? There are dozens of models to choose from and the best isn’t always the most expensive. From Black and Decker to Remington, I’ll be providing pole saw reviews for the top three electric models on the market today. Before we dive into the details, here is a quick comparison chart so you can easily review the features of our top 3 models. The best-selling electric pole saw on Amazon. The Remington RM1025SPS is powerful, durable and very affordable at right around $100 depending on the current sales promotions. Easy to use, this model features a 10-inch bar and chain with a low kick-back which makes for easier cutting. Most users will be able to reach heights between 10 to 15-feet using the Remington Ranger. The adjustable pole allows users to lock the pole length to ensure a safe trimming at all times. Comfortable to use, there is a nonslip grip that allows users to maintain their grip even when raining. Want to remove the saw? This model features a 2-in-1 design that allows the saw to be removed without any tools. Why would you do this? This allows your branch and tree limb trimmer to be converted into a chainsaw that you can use to cut wood – it’s the perfect saw combo. 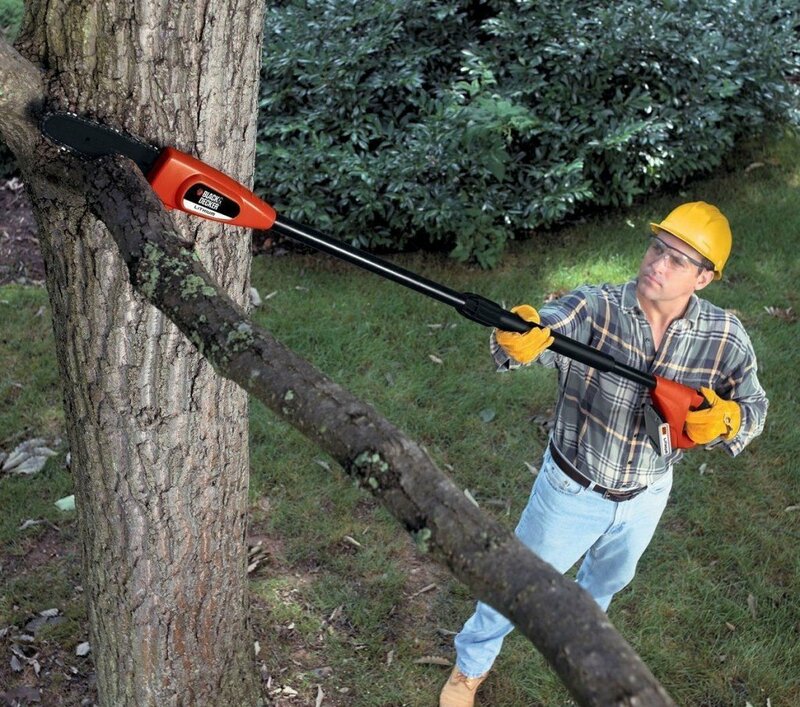 Using a powerful 8 amp motor, you’ll be able to cut through most branches with ease. Strong yet lightweight, the motor’s optimized design lessens arm fatigue and cuts with more precision. Users will also receive a 1-year limited warranty from the date of purchase. If this model breaks, you can have it replaced or fixed for free. Anti-rotation design for stable use and added safety. 8 amp optimized electric motor. Push-button oiler for smooth cutting. Cord lock that prevents the cord from disconnecting. Adjustable upper and lower poles with a 10-foot maximum length. With over 1,000 reviews, this pole saw has received some of the highest ratings. 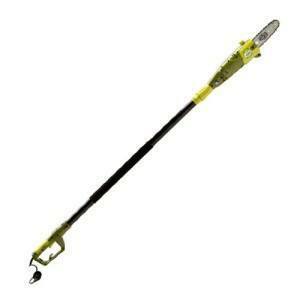 Easy to use and assemble, you’ll easily be able to cut through 8 – 10” branches. Many users state that they prefer this model to gas-powered pole saws. The one concern is that this model may be slightly heavy for some users when using it for an extended period of time. Total weight for this model is around 11 pounds. For me, this is the best electric pole saw on the market. It’s affordable, powerful and can even convert to a chainsaw if needed. Black and Decker pole saws are known for two things: quality and durability. This model is my number 2 choice and is slightly higher than the Remington, but currently still priced under $150. However, there is one benefit – this is a cordless pole saw. Normally, cordless models make me nervous because the battery life is always subpar. This is not the case with the LPP120. 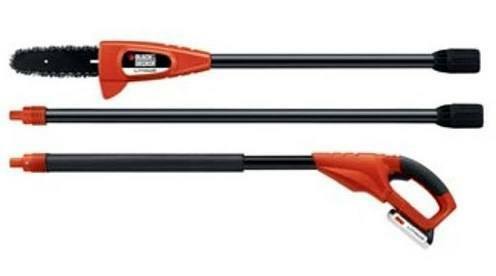 Featuring a 20-volt MAX lithium-ion battery, this model can cut through 100, 1.5” branches on a single charge. This is not quite commercial-grade longevity, but it is great for yards of all sizes. An overhead reach of 14-feet is possible. The extension features both a 6 ½ and a 10-foot option. Easy to maneuver, this model weighs just 6.3 pounds and has an 8-inch cutting chain. A maximum cutting diameter of 6-inches allows you to cut through most tree limbs – small and large – with relative ease. Upon assembling this model, it’s very important to tighten the chain appropriately. If you don’t, your chain will eventually fall off. Extension replacements are available for this model, and Black and Decker includes a standard 2-year warranty. Cordless model ran on 20-volt lithium batteries. Lightweight, this model is just 6.3 pounds – much lighter than our last model. 2-year warranty, so you have peace-of-mind. 6 ½ – 10-foot cutting extension. An amazing product. This saw has been reviewed over 800 times and continues to receive great marks from consumers. The LPP120 is an exceptional saw that is lightweight and powerful. What are some things people complained about? The one issue is that the battery’s charge starts to lessen over time. If you’ve ever used any battery-powered tool, you know that this eventually happens with batteries. One way to prevent this is to keep the battery charged when not in use. If you leave the battery uncharged too long it will start to deteriorate. The manufacturer’s instructions do warn consumers to keep the battery fully charged to prolong its life, but how many people actually read the manual? Another solution and one I recommend is to buy an extra battery. This will allow you to have a backup just in case one dies, or if you need to trim a large area. Another bonus is the 20-volt battery is compatible with a whole list of other Black & Decker cordless tools including power drills, cultivators, edgers and hedge trimmers. The final of my pole saw reviews is the SunJoe SWJ800E. Very affordable at just under $80 at the time of this article, this is an exceptional model that is perfect for anyone on a tight budget. It’s powerful, comfortable to use and even has automatic oil lubrication. Number 3 on my list, SunJoe features a 6.5 AMP motor, which is less powerful than the past two models mentioned. Yet, it’s powerful enough to tackle most jobs with ease. The saw extends a maximum of 8-feet, which is 2-feet less than the Remington and Black and Decker. If it wasn’t for this, SunJoe may have been higher on my list. A self-tension mechanism is present, so your chain will never get lose and fall off. An 80ml oil tank will help lubricate the chain when needed to ensure a smooth, long-lasting cut without the fuss. Fully electric, this model will need to be plugged in during use. During initial tests, cutting through 4” thick branches was a breeze. Lightweight at just 7 pounds. 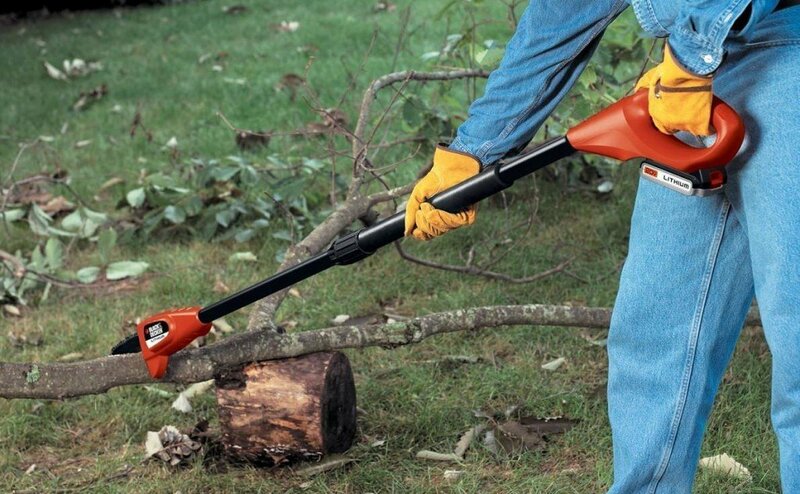 Rubber handle provides comfort even when cutting through thick branches. Automatic lubrication system ensures easy cutting at all times. Plastic blade cover for safe storage options. Not only is this model affordable, but it has a lot of power that’s packed into just 7 pounds. Being corded, you’ll never have to worry about a battery running low or running out of gas. The only downside is that cutting through 5” – 6” branches is a little tough for the SWJ800E. If I had to pick just one model, it would be the Remington RM1015SPS. 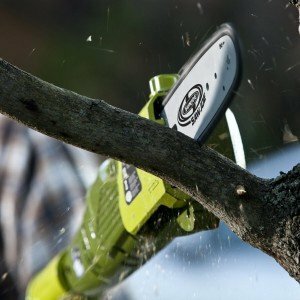 This model cuts through thick branches, has a 2-in-1 design, and has an extremely optimized and powerful 8 AMP motor. Click here to buy the Remington RM1015SPS today. If you’re still unsure, check out our Buyer’s Guide to find the best electric pole saw to meet your needs. If you’re not sure which pole chainsaw will work best in your yard, you’ve come to the right place. 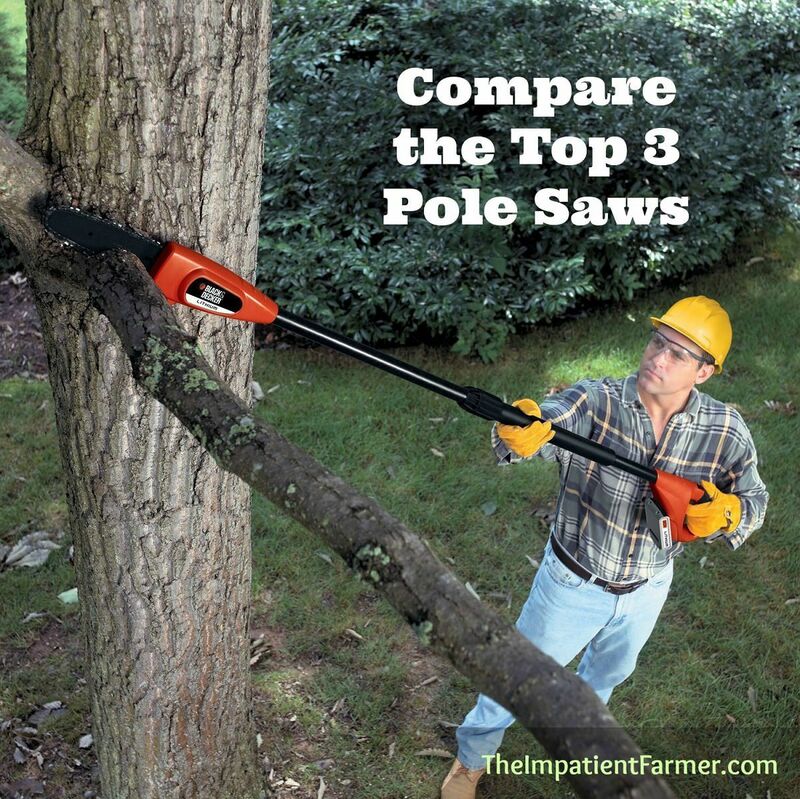 We created this buying guide to help you find the best pole saw for you. From power to price, reach and bar length, our guide will help you find the right pole chainsaw for your needs and your budget. A pole saw is exactly what it sounds like – a small chainsaw attached to a pole. Of course, they’re not quite as powerful as a full-size regular chainsaw, but they’re great for pruning and trimming. Equipped with a long pole, these saws can easily reach high into trees and hard-to-reach places to get the job done quickly and efficiently. Pole saws help you cut high branches without climbing trees. Pole saws come in a variety of types, including gas, electric, cordless and manual. What’s the Alternative? Climbing Trees? Well, climbing trees is one option, but it’s not always the safest option. Pole saws are the most common tool used to prune and trim, but loppers can also be used. And depending on how large the loppers are, you may just find yourself having to climb trees to get the job done. 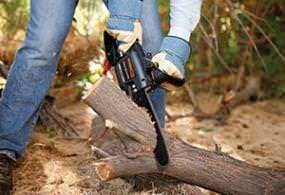 Of course, chainsaws can also be used, but these typically aren’t the best option for pruning or trimming – unless the branch is within reach. Climbing a tree gets a bit dangerous with a chainsaw in tow. The right pole saw for you will depend on a variety of things. Type, power, chain size, reach and price are all things that need to be considered before you buy a new pole chain saw. Corded Electric: An electric pole chainsaw is generally lightweight, easy to use and virtually maintenance-free. As you may have guessed, these saws plug into an electrical socket, so there’s no need to worry about a battery dying or running out of gas. Electric models are quieter, but you’re limited by the length of the cord. For small yards, corded electric models are a good option. Cordless: A cordless pole saw is the most convenient option. There’s no electrical cord or gas to worry about. For small yards, a single battery charge is typically all you need to get the job done. The only issues with cordless models is that they’re not quite as powerful as electric or gas, and they tend to be a bit heavier than other options. 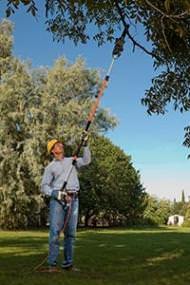 Gas: A gas powered pole saw is the most powerful option, and the tool of choice for professional landscapers. With enough gas on hand, you can operate these saws for hours each day. Gas is a great option if you have a tough job or a large yard. What do you plan on using the pole saw for? The type of job you’ll be using it for will determine how much power you need. If you need to cut stronger, thicker branches, a gas-powered saw is your best option. These are the most powerful type of pole saw, so they’ll be able to make quick work of thicker, larger branches. If you have a smaller yard but still need a fair amount of power, an electric model is a good choice. They’re lightweight and easy to use. Just keep in mind that you’ll be limited by the length of the cord. For small yards with lighter jobs, a cordless pole saw pruner is a great choice. Cordless models don’t pack as much power as corded or gas models, but they’re more than sufficient for most jobs. And you won’t have to worry about tripping over cords, or mixing gas and oil. Pole saw bars are measured in inches and they refer to the length of the surface that the saw’s chain travels around. Most pole saws have an 8” bar, but you can find models with 12” bars too. Because longer bars require more power, you’ll only find larger 12” bars on gas-powered models. Generally speaking, the longer the bar is, the better its ability to cut through thick tree limbs. How can you know what length you’ll need? First, find and measure the largest tree limb you plan to cut. You’ll want to look for a saw with a bar size that’s greater than this limb. When buying pole saws, make sure you know how high you need to reach. The one advantage a pole saw has over loppers or regular chainsaws is that they provide an extended reach. Naturally, the length of the pole is an important factor to consider. Most pole saws have telescopic poles that allow for easy storage and length adjustment. The maximum extension of most pole saws can range anywhere between 8 and 12 feet. Determine how much reach you’ll need to trim the highest branch. And make sure you look at the maximum extension – not pole reach. Pole reach often takes into account the height of the user, so you may see manufacturers advertising a pole reach of 14 feet or more. Of course, the price is another factor you’ll need to consider. Corded electric pole saws tend to be the most affordable option. Gas is the most expensive, but it’s also the most powerful. Cordless saws are priced somewhere in between gas and corded electric. Accessories are another thing to consider. Models that come with a pole saw attachment may double as a string trimmer. I highly recommend reading through some pole saw reviews to help you find a reliable, affordable model. Cutting branches that are high out of reach can be dangerous, but learning how to use a pole saw properly and taking the necessary safety precautions can prevent accidents and injuries. Make sure your saw is in good working condition before you start using it. Make sure the work area is clear and that limbs have a clear retreat path. Wear snug-fitting clothes, heavy-duty gloves, safety glasses, protective footwear, earplugs and a safety hat. If you have long hair, make sure it’s covered and out of reach of the saw. Apply light pressure when cutting, and don’t force the chain.